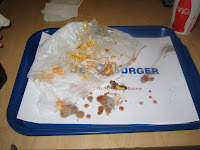 Uprooted Californians’ in NYC are always talking about how much they miss In-N-Out Burger. In-N-Out are a West Coast based fast food burger chain with a simple menu and fresh not frozen burgers. Complete with a not-so-secret menu, In-N-Out have established themselves as an institution. 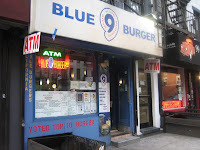 If you’re in New York and looking for something similar, stop on into Blue 9 Burger. 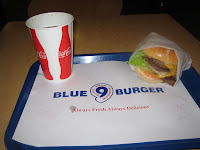 Located new NYU and served at affordable NYU Student Prices, Blue 9 is the closet to In-N-Out you’ll find. While they don’t serve a “3×3” or “animal style” you can order them in that fashion along with a couple of their own creations. They also have fresh smoothies but why on Earth would you go to a greasy burger joint for that? I asked “what comes on a Blue 9 Burger”? I was told 2 burgers, cheese, lettuce, onions, tomato and 1000 Island Dressing. I said “I’ll take one medium rare please,” but found it odd that it wasn’t labeled as “special sauce” or “Blue 9 spread” or anything other than admitting a chincy skimp on quality. They make the burgers to order, unlike your typical pre-cooked fast -food patty which is certainly a bonus and difficult premise for a small fast food joint. The burger came up quickly (I was the only one there) and looked really good. 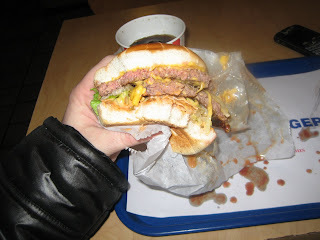 The bun was a standard white bun and barely held the very sloppy burger together. The sauce was uninspiring much like the weak bun. 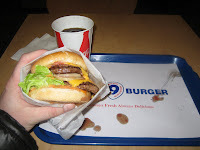 The burger itself was nice and juicy and cooked well. It had a good flavor and in general, I enjoyed the sandwich. In-N-Out should feel flattered but remain confident. This entry was posted in Burgers, East Village, Hamburgers and tagged best burger, blue 9, burger conquest, cheese, ciancio, french fries, hamburger, in n out, nyc, rev, review, secret menu, the great burger conquest blue 9 burger fresh not frozen in and out cheese in-n-out, the rev meter for social community. Bookmark the permalink.